Congratulations to "Cynthia", the winner of Nancy's giveaway. Thank you to all who participated. Thank you Just Romance Suspense for hosting me today. I’m so thrilled to be here. Why are secondary characters, or for a crueler description, incidental characters so forgettable? Every story contains a character who has a fleeting presence in the story, but then seems to just disappear. They exist in those few sentences on the page for one reason, to help move the story along. This type of character is called a secondary character, and most readers will glance at the name, give them a momentary thought before forgetting they ever existed. Their focus is on the main characters ― which is where it should be. In real life, we all encounter what could be considered secondary characters; the clerk ringing up your purchases at the grocery store, the busboy who removes the dishes from your table at a restaurant. But these people, who only exist in our lives for minutes, are real. We comprehend that they have whole meaningful lives completely separate from our own, even though they may disappear from our lives forever. these characters so easily written off the page by editors? As an author, I spend a good amount of time developing all the characters in my stories. Their lives, their back stories become very real to me. In the Shadow of Evil begins with the same pivotal event that occurred in my first book, In the Shadow of Greed. Both stories begin after a horrific attack of a young college student named Hanna Tu. One brother, the hero of In the Shadow of Greed, Jason McNeil is sent off to the hospital to get the victim’s statement. The other brother, Jared McNeil, the hero of In the Shadow of Evil went to the crime scene. From In the Shadow of Greed, the reader learns very little about who Jared is and what kind of man he has become. In fact, the story could have existed without him. But Jared McNeil has his own story. He is affected just as deeply by the events of Hanna’s attack as Jason was. That event will live in Jared’s nightmares for the rest of his life. 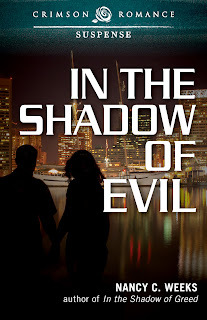 In the Shadow of Evil takes Jared on a rough ride where he must learn that love and trust can overshadow even the darkest obsession. I believe readers will love reading about Jared’s amazing story, and how that one horrific event leads him to Jennie McKenzie and his happy-ever-after. As an author, I have the privilege of diving into the lives of my characters, giving their stories the weight and purpose they deserve. In a small way, I’m trying to honor their humanity. Have you ever run across a secondary character that you wish the author would have brought back so you could live his/her story? 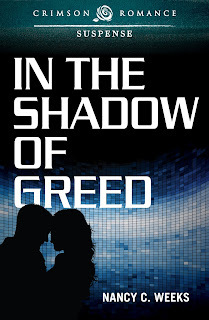 Nancy will be giving away a digital copy of In the Shadow of Evil and Inthe Shadow of Greed to one person who leaves a comment and/or email entry. Elías Mendoza’s personal vendetta against the McKenzie family rests on Jennie’s shoulders. As she cradles the bullet ridden body of her ten-year old student, she knows Mendoza is responsible. Quinton’s death is a message. Jennie’s life belongs to only Mendoza. But she has her own message. No one else dies. Her life means nothing as long as Mendoza is free. Jared McNeil has spent ten years with Maryland’s Special Crime Unit and very little rattles him. When the haunted teenager he once tried to protect walks into his precinct now a beautiful woman, he wants nothing more than to wrap her in his arms and never let her go. But he soon realizes she is there only to settle her debts before she goes after his nemesis, Mendoza. Jared’s vow to stay away from Jennie until the task force destroys Mendoza now means nothing. What Jared and Jennie don't understand is there are forces at play greater than the evil shadowing them, but time is running out. United, they can do anything. Alone, they will fail. Nancy C. Weeks has loved happy-ever-after romances since she was in her early teens. While still in college, she met and married her hero and spent the next several years honeymooning and working overseas. Today, she lives in suburban Maryland with her husband of more than thirty years. Her two children are in college and she spends her days out on her deck writing as the local bird population keeps her company. She loves to hear from her readers. Giveaway ends 11:59pm EST Aug. 31st. Please supply your email in the post. You may use spaces or full text for security. (ex. jsmith at gmail dot com) If you do not wish to supply your email, or have trouble posting, please email maureen@JustRomanticSuspense.com with a subject title of JRS GIVEAWAY to be entered in the current giveaway. Most of the writers or series on my list of top favorites seem to respect the role of the secondary character(s). The In Death series by J. D. Robb is beloved by fans primarily because of the influence and development of those characters who are integral to plot and the lives of the heroine and hero. Robyn Carr's Virgin River and Thunder Point series take this to the highest level where the secondaries often share as much page time as the main ones. Paying attention to the secondary roles seems, IMHO, to provide a richer story and reader experience. Thanks for the topic. I could not agree more. Secondary characters enrich a story, make it more believable. I just love J.D. Robb and Robyn Carr's books. Great examples. Thanks so much for dropping by. Looking forward to reading both of your books.. Thanks so much for dropping by. As a reader, I view secondary characters as part of one big family. They all have a purpose. As a writer, what surprises me most is how a secondary character can take on a life of it's own. Father Anthony in In the Shadow of Evil developed into such an amazing character, and captured a place in my heart that I just had to bring him back in my new work in progress, In the Shadow of Malice. Ex-special forces soldier turn priest--there's a story there that demands to be told. Wow, Nancy, both of your books sound very intriguing to me. I have been reading new, to me, authors lately and have discovered real treasures. I am certain you will soon become a favorite too. What a sweet thing to say. I hope you enjoy both books and thanks so much for coming by. HUGS! This is a great article and I do wish publishers understood the importance of secondary characters. I've been told to cut back on some of mine with the idea they hog the scenes, but I think they enhance the main characters. They are mirrors, reflecting the story line and/or suspense. Though with mine, it's more on the humorous side. Applause, Nancy! Thanks for the applause! I had four characters cut in my new release. It was so hard for me to see my story without them.One thing I did notice though was that it made the secondary characters that reminded much stronger. Somehow in this series, I'm going to find a way for them to return. LOL. I really appreciate you stopping and leaving a comment. Have a great Friday. I enjoy secondary characters... they add more to a story... and it is great to see when they get a chance at their own story. Both books sound really interesting... thanks for sharing with us today! I'm glad you enjoyed the blurbs. Thanks so much for taking time to stop by. Have a great long weekend. Secondary characters add humor relief when the situations get tense like Peabody in the In Death series. Some secondary characters do end up with their own story thus creating a subsecondary characters in their story. I love Peabody. She is one of my all time favorite characters in the In Death series. So glad you dropped by. Thanks Brenna. I'm glad you enjoyed it. Have a great weekend! Yes, there have been many books thati would have liked to hear more about the secondary characters. I agree with previous statement,these characters add either humor or tension where required. I definitely agree with Kai, i love peabody!!! Thank you for this opportunity. Thanks for coming by for a visit. Best of luck! HUGS! I like your take on Secondary Characters Nancy. Also, I like the title of your books. Please enter me in your draw. You got me interested! I'm so glad you like the titles of my Shadow series. One day, I'm going to write about that particular struggle. Coming up with titles of my books took me weeks. LOL! Best of luck! Like the others have said, most of my fav authors create such memorable 2ndary characters that I get as invested in them as the main! JD Robb and Suzanne Brockmann instantly come to mind. Suzanne did an awesome job of walking awesome secondary characters in and out of her stories which hooked me and made me even more invested when they finally got their own starring roles! Thanks for sharing and congrats on the newest release! You stated it perfectly. Secondary characters help the reader become more invested in the story. Best of luck and hope you have a great weekend. Hugs! I totally agree about Robyn Carr's works. Secondary characters make a story richer & fuller. The main characters should not be living in a vacuum. Thanks so much for dropping by. I'm a real Robyn Carr fan too. I learn so much from other writers like Robyn. I hope you have a few minutes this weekend to read a great story. Hugs!